What fonts do you use for programming, and for what language/IDE? I use Consolas for all my Visual Studio work, any other recommendations? Either Consolas (download) or Andale Mono (download). I mostly use Andale Mono. I wrote an article about programming fonts a long time ago, I think Consolas wasn't even out yet. I find that typing Illegal1 = O0 is a good test of suitability. I've really fallen in love with Droid Sans Mono. I really really like DejaVu Sans Mono. It is very clean and easy on the eyes. Just beautiful and I find I can read it for hours on end. I like Envy Code R.
+1 for Monaco, although this blog post is making me think about switching to Inconsolata. I'm curious as to what point size y'all use, I use the TextMate default size of 12pt. I use Bitstream Vera Sans Mono, but you need to activate ClearType to get it readable . I like the 'Illegal1 = O0' readablility test, mentioned earlier in this thread, thanks for that. Anarch, 32 points, ofcourse. Code with style! For UltraEdit and anything for that matter, I use the good old Courier New. I've found Consolas to difficult to read with it's over anti-aliasing. I use Lucida Console for years and never find anything better. However I tried a few times Consolas fonts and simply -- I prefer Lucida Console. I like Terminus for some command line stuff, at least scrolling log files and irssi/irc (TTF versions available). Screenshot of the terminus.ttf in action below (PuTTY on Windows XP with ClearType enabled). I use Consolas on my mac, BTW; here's a link to download the consolas TTF files if you want to install this (Mac/Win/Linux). I don't use Consolas, though it does look good on LCD, but sometimes I'm not on LCD, like when I'm giving presentations and then it looks crap. 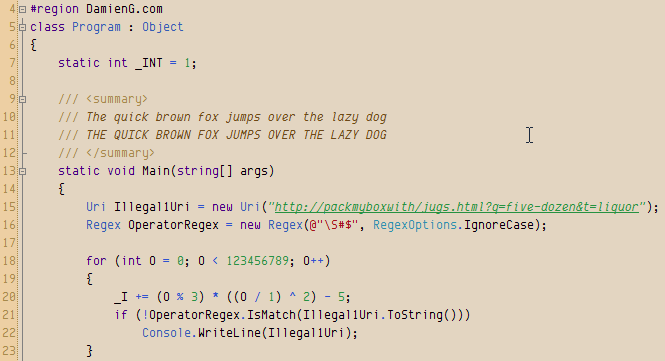 My current font of choice for programming is the Liberation Mono font. Oh man, just discovered why the text on Stack Overflow looks like crap, it forces Consolas which is a cleartype font, and on my current setup which didn't have cleartype enabled, it looks very bad. Going to make a bugreport on uservoice. I have been using the Dina - http://www.donationcoder.com/Software/Jibz/Dina/index.html - font for awhile now for text editing and it seems to be doing the job nicely. ProFont. Am I the only one still using it? I like Fixedsys in Visual Studio. It's a classic. No anti-aliasing blur. I'm amazed nobody has mentioned Pragmata. It's the BMW of programming fonts. Condensed, readable, and the pinnacle of simple elegance. There is now a fundraising project going on for PragmataPro (which covers a larger portion of Unicode than Pragmata) to make it available for free under a Creative Commons license! I use Inconsolata with UltraEdit on Windows. 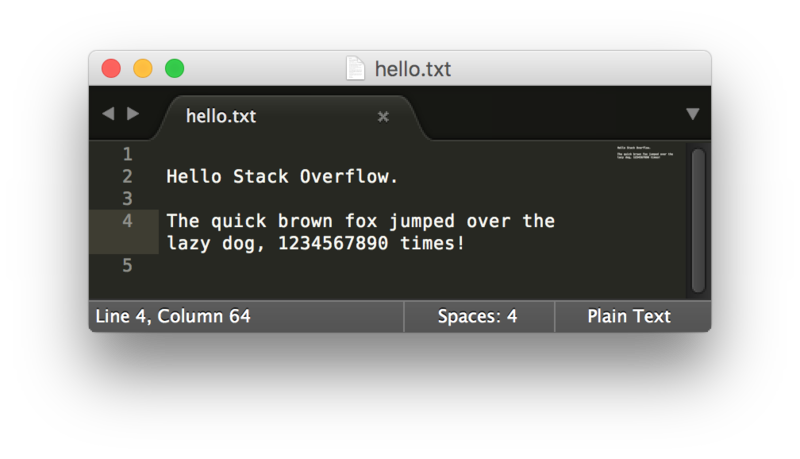 With TextMate (on the Mac) I prefer Monaco (it's the default font). Adding a vote for Consolas. It feels very easy on my eyes. I never found a reason to stray from Courier New. I don't think I'd have a problem with any font so long as it's sans-serif. Mono-spaced fonts are nice for coding, too. I use a proportional font too. They seem good for the same reasons they work in books and magazines: the more variation between characters, the easier it is for the brain to distinguish them; and you can fit more on the screen. Indentation still works fine: 6 leading spaces is still twice as wide as 3 leading spaces. I use a version of Georgia that I hacked to make the lower case "l" look less like the digit "1", and put a slash through the zero. I think the anti-aliasing blur on Consolas is caused by monitors which do not have ClearType enabled. Consolas was designed for ClearType. 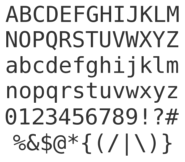 Some other discussions of programming fonts that may have more suggestions are the comments to this blog post on typographica and this topic on a text editor's forum. DejaVu Sans Mono (sometimes known as Panic Sans), size 11, anti-alised. Previously I only used fonts that weren't anti-aliased, but it just seems to work for this font. Not the answer you're looking for? Browse other questions tagged fonts development-environment or ask your own question. Good font for code presentations? Alternate fonts for console windows? How can I change line height / line spacing in Eclipse? What's a the best small font for eclipse? What is the best font for programming in a Linux Desktop? How to get Visual Studio 2012 to render monospaced fonts correctly?